If weight is an issue for your workflow, the Lavie Z should be on your list. The 875 gram unit is so light you’ll wonder if you remembered to put it in your bag after leaving the house. We’ve heard “it feels like a piece of paper” and “it feels like foam” from two different people who have picked up our test unit. Battery life is something that we’ll be watching for closely as light weight and long battery life don’t often come in the same package. Early impressions indicate that NEC may have had to sacrifice some battery to hit their weight target. 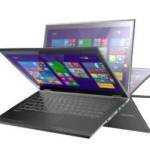 However it should be able to last at least 5 hours as per Intel’s Ultrabook specifications. Early impressions reveal the keyboard to be better than average. I’ve also been surprised how loud the fan can get in the Lavie Z. It isn’t beyond what you are likely used to, but it sounds odd coming from such a petite machine! The 1600×900 display has a nice thin bezel which some of you will definitely enjoy as I have. Our full review of the NEC Lavie Z is in the works. Drop us a line if you’ve got any questions regarding the unit. Note from the author: I’m interested to know what readers think of the first-person unboxing. Please let me know below! Wow, importing costs a lot. $1799.00 to $2399.00 is quite a bit of money for this. I guess people buy these imports though. Dynamism wouldn’t still be in business if no one did. The NEC Z even before Dynamism takes their cut is a very premium notebook, that sells in a very expensive country for electronics. I’ve had my eye on this since it was first announced last spring, the $2000+ price tag kept sort of kept me away. Thanks for doing a preview of it, it does look pretty sharp. Glad to hear the keyboard is nice, that would be my main concern without having a hands-on first. It’s too bad the RAM cap is 4GB however. Really curious to read the final review. re: the 1st person unboxing, the shaky camera was not my favorite, especially at first when moving in and out a lot. I dont know how a fixed cam would have worked better overall or not. First person cam: I assumed it would be alot shakier than it actually was, but i prefer camera stand over this. Better to just have a fixed camera unless you meant not doing those unboxings where a good chunk of the video is of the guy instead of the actual product then the video is excellent. 1. NEC also sells a business version of the LaVie Z, the VersaPro J / Type VG. Possibly you got that? 2. Is that the same power plug as the Thinkpad X1 Carbon? It looks like it a lot, the power adapter reminds me of a Thinkpad power adapter with how the cable comes out on a right angle, and NEC and Lenovo have been pretty tight as of late. 3. Really interested in battery life. That so far has been a deal breaker for me for pretty much every ultrabook so far. 4. On the topic of the unboxing itself, I sorta like the first person thing, but the camera is so fisheyed that it gets annoying. We’ll look into the Lavie Z / Lavie G situation, thanks for the heads up. Not sure regarding the X1 Carbon, I’ll have to compare with Chippy’s unit. One cool thing I forgot to mention about the Lavie Z power adapter is that the end that plugs into the Ultrabook itself has no problem plugging in right side up or upside down. 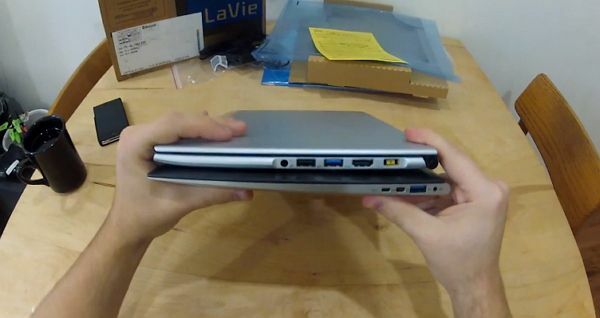 If battery life has been an other issue for you on Ultrabooks, I don’t think the Lavie Z/G will cut it. So far it seems like one of the lowest battery lifes of the units I’ve tested. Does the importing cost that much? If you buy in Japan, the most cheapest model is about 1000$(80000yen).